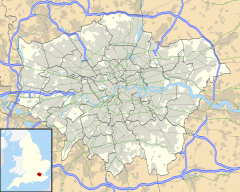 Northumberland Park is a ward in the Tottenham area of London Borough of Haringey, in Greater London, England. It is largely residential, consisting of houses and flats. It is the location of Tottenham Hotspur Stadium, the home ground of Tottenham Hotspur F.C.. The ward is represented by three Labour councillors. The Northumberland Development Project is a major project that centers on the construction of the Tottenham Hotspur Stadium but also include hotels, residential units, and retail spaces. It is intended to be the catalyst for a 20-year regeneration program for Tottenham planned by the Haringey Council. Among the projects planned is the High Road West regeneration scheme which aims to redevelop the area between the stadium and White Hart Lane station. The White Hart Lane Station will be rebuilt, while the Northumberland Park railway station is being reconstructed with significant improvements for services planned. ^ "Your Councillors". Haringey London. ^ Conn, David (30 October 2013). "Tottenham's new stadium: how club can cash in on development plan". The Guardian. ^ "Visit to Northumberland Park Depot". Institution of Railway Operators. Retrieved 12 September 2018.